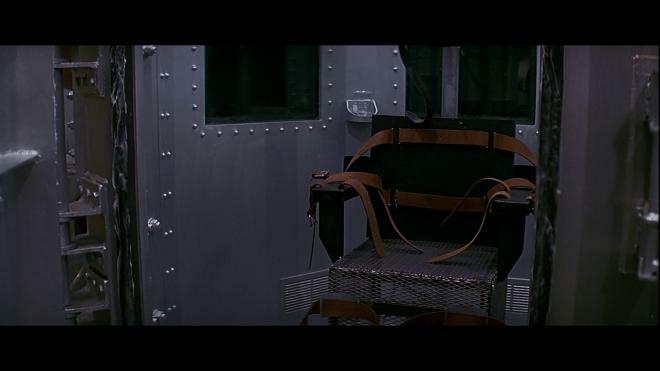 In 1996, legal thriller juggernaut John Grisham punched the anti-death penalty theme in the gut with the near back to back releases of A Time to Kill and The Chamber. 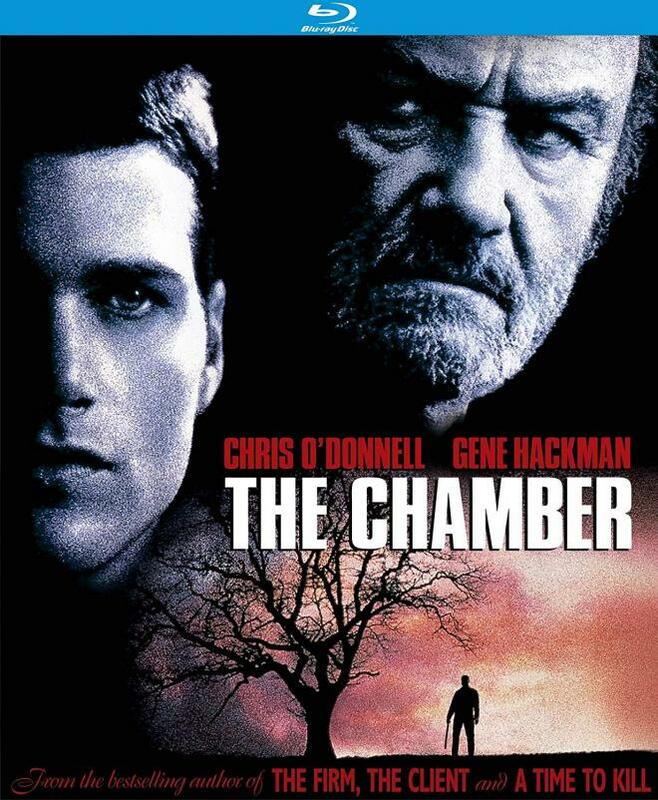 The Chamber was the weaker entry of the duo and if it weren't for an excellent turn from Gene Hackman and an impressive showing from Chris O'Donnell, the film wouldn't be nearly as good as it is. Not the best Grisham movie, but not the worst either. Kino Lorber Studio Classics brings The Chamber to Blu-ray with a decent image transfer and a solid audio mix. If you're a fan of Grisham this one is Worth A Look. "I don't give a damn how you feel. I'm telling you who you are. Isn't that why you're here?" Chris O'Donnell trades in his rubber super-suit for a three-piece as Adam Hall, an up and coming Chicago attorney with an unfortunate relation to his convicted murderer racist bigot grandfather Sam Cayhall (Gene Hackman). Sam's due for execution for the bombing of a Jewish man's law office resulting in the death of two children and Adam is hellbent on ensuring that his grandfather doesn't make it into the gas chamber. 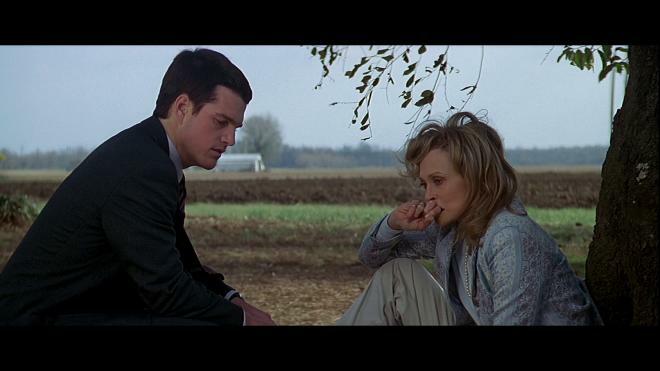 Against the wishes of his aunt Lee (Faye Dunaway), Sam starts digging into the past of Sam's sad history within the KKK. As certain revelations come to light, it becomes apparent that Sam may not have acted alone - and possibly may not even have built the bomb. On July 24th, 1996 John Grisham had a hit novel adapted into a film with a great cast and released into theaters to critical and fan acclaim. That was A Time to Kill, and it proved to be a slingshot for Matthew McConaughey's career while giving Samuel L. Jackson one of his best starring roles. A scant two and a half months later, The Chamber squeaked its way into theaters. Similar themes about death row, a racially biased legal system, and plot points featuring the KKK. Needless to say, The Chamber might have managed a bit better if it had been delayed a year as content familiarity didn't help distinguish it from its sibling adaptation. Not even a great performance from Gene Hackman could win over critics and draw folks to theaters as this legal family drama faded into obscurity as a lesser entry in Grisham's catalog. As much as I love schlocky action films and gory horror flicks, legal thrillers and Grisham movies are one of my guilty pleasures. They're not that great. Most of them are pretty standard and predictable, but even at their worst, they're fun little meditations on the law. When they're great you can appreciate their themes about how the legal system affects people. Now, The Chamber isn't a great movie. Its first half is great stuff but the home stretch is a bit all over the place. However, it does offer an interesting look at how a crime affects not only the criminal and the victim but the family of the criminal who has to live down their family legacy. Where The Chamber works best is when it's exploring these themes. Adam want's closure for his father's suicide he witnessed as a child. The only way to do that is by confronting the monster the family has kept in the closet for decades. Even if they can only interact between a wire screen, these moments prove tense and showcases the material's confidence. At the same time, Sam doesn't want to face the responsibility his actions have had on his estranged family. It's some good stuff and had the story kept the focus and not tried to punch in cliche thriller elements it might have fared better. 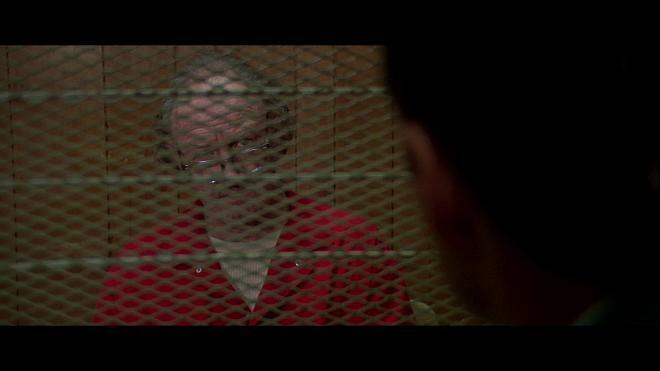 This is the closest we'll get to see what Gene Hackman would have brought to Hannibal Lecter and he does a pretty good job as the empathetic monster. As it stands, it's a lesser Grisham movie that happens to feature great performances from its primary cast. It's not the best Grisham thriller, but it isn't the worst either. The Chamber arrives on Blu-ray courtesy of Kino Lorber Studio Classics in a single disc release. Pressed onto a Region A locked BD-25 disc, the disc is housed in a standard sturdy Blu-ray case. The disc loads directly to a static image main menu with traditional navigation features. The Chamber arrives with a dated but still decent 2.35:1 1080p transfer. This transfer doesn't look to have been touched in quite some time, probably dating back to the original DVD mastering, however, that isn't entirely a bad thing. The source for this transfer is in impeccable shape without any signs of speckling, scratches or any age-related wear. Film grain is apparent but not completely resolved as details don't really spring to life. Facial features, clothing, furniture, and production design have some of the cursory standout elements to them but a bit of edge enhancement gives the image a little crunchy quality to it. Thankfully there isn't any terrible haloing or banding, but all the same, this looks in line with a mid-90s film that hasn't really seen much TLC in the past 20 years. Close-ups look the best. It's much better than the old DVD which I was surprised to discover I still had and some quick disc swapping shows this Blu-ray's improvements. But it's not the most stunning image. The Chamber arrives packed with a DTS-HD MA 5.1 mix as well as a DTS-HD MA 2.0 stereo track. The good news here is whichever one you choose, you're getting a pretty solid audio mix. The 5.1 track is the cleaner and clearer of the two offering a better range of element placing and atmosphere. There isn't a dramatic amount of surround activity as the film takes place in small places but when it opens up in the streets of Chicago or a few party sequences to the Klan rally towards the end it's a lot more active. Dialogue is clear throughout without any issues and the Carter Burwell score comes through nicely to round out the mix. 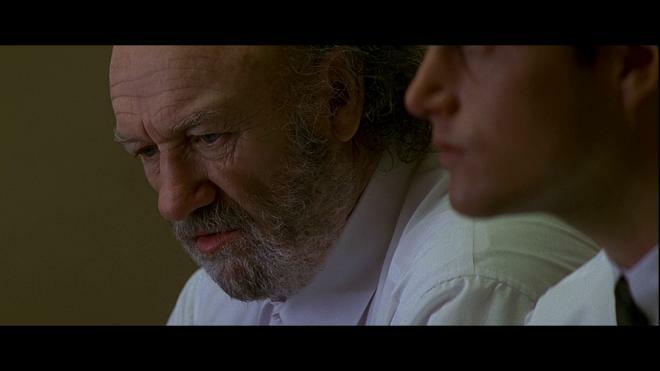 The Chamber isn't the best Grisham flick to come out of the 90s, but it's still decent enough entertainment largely because of a magnetic performance by the always excellent Gene Hackman. Dwarfed by A Time To Kill at release, the film still holds its own. Kino Lorber Studio Classics brings The Chamber to Blu-ray in decent order. The image transfer may be dated but it gets the job done and the audio mix is solid stuff. Sadly no meaningful bonus materials were included. 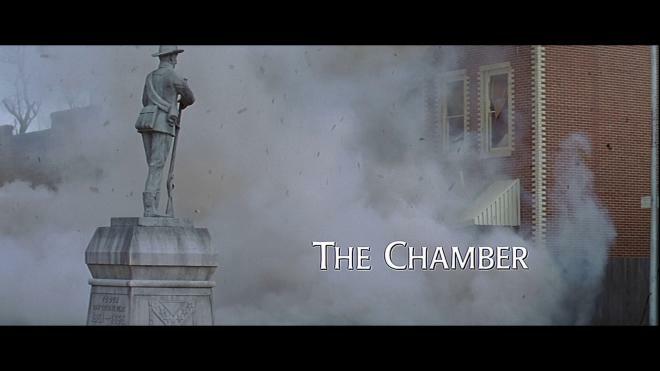 If you're a Grisham fan in need of a fix, The Chamber is Worth A Look.